This website contains general information only. The information contained on this website is not intended to convey or constitute legal advice on any subject matter or intended as advertising or a solicitation. Readers should not rely on the information presented on this website for any purpose without seeking the legal advice on the specific facts and circumstances at issue from a licensed attorney in the reader’s state. The information on this website contains general information which is intended, but cannot be guaranteed, to be always up-to-date, complete and accurate. Any representation or warranty that might be otherwise implied is expressly disclaimed. Snyderman Law Group, PC expressly disclaims all liability or responsibility in respect to actions taken or not taken based on any or all of the information contained on this website. The content of any Internet email sent to Snyderman Law Group, PC or to its attorneys at the email addresses set forth in this website will not create an attorney-client relationship and will not be treated as confidential. Readers should be aware that communications via the Internet may not be secure. 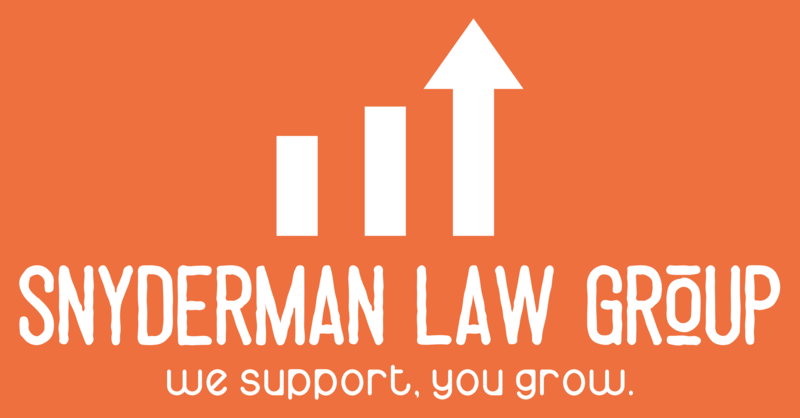 Snyderman Law Group, PC does not necessarily endorse, and is not responsible for, any third-party content that may be accessed through this website. Snyderman Law Group does not currently collect personal identifying information through our web site except for information that you send to us in an email message, or that you send us when you register for newsletters, events, or receipt of materials. If you choose to send us an email message, including submission of your resume, we may retain the content of the email, your email address and our response. Snyderman Law Group does not sell, rent or exchange any personal identifying information to or with unrelated third parties. However, Snyderman Law Group may share such information with related third parties or unrelated third parties in connection with or maintenance and operation of the Snyderman Law Group web site or as may otherwise be legally required. Although Snyderman Law Group uses security that it believes to be appropriate to protect the personal identifying information received through its web site, Snyderman Law Group does not guarantee that its security precautions will protect against any loss, misuse or alteration of any such information. Snyderman Law Group may at times provide links to other web sites for your convenience. We recommend that you review the privacy and security policies of each website you visit before providing any personal information. We reserve the right to modify this Policy at any time. Your continuing to access any of our websites constitutes your acceptance of any modification to this Policy in effect at the time of your access. No modification or attempted modification of this Policy by you shall be binding on Snyderman Law Group. Please also see the Disclaimer that applies to this website and states that the information contained on this site is not intended to convey or constitute legal advice, or intended as advertising or a solicitation.